For a convenient breakfast-time shake, just add a scoop of GREEK YOGURT PROTEIN SMOOTHIE POWDER to a glass or shaker cup filled with 6-8 fl oz of cold water or your favorite beverage. Then stir or shake for 20-30 seconds or until powder is dissolved. Greek Yogurt Protein Powder (Whey Protein Concentrate, Skim Milk, Yogurt Cultures [Heat Treated After Culturing]), Whey Protein Concentrate, Gum Blend (Cellulose Gum, Xanthan Gum, Carrageenan), Natural Flavor, Creamer (Sunflower Oil, Corn Syrup Solids, Sodium Caseinate, Mono & Diglycerides, Dipotassium Phosphate, Tri-Calcium Phosphate, Soy Lecithin, Tocopherols), Milled Chia Seed, Strawberry Powder, Lecithin, Freeze Dried Strawberry Granules, Beet Color, Salt, Sucralose. Greek Yogurt Protein Powder (Whey Protein Concentrate, Skim Milk, Yogurt Cultures [Heat Treated After Culturing]), Whey Protein Concentrate, Natural Flavor, Gum Blend (Cellulose Gum, Xanthan Gum, Carrageenan), Creamer (Sunflower Oil, Corn Syrup Solids, Sodium Caseinate, Mono & Diglycerides, Dipotassium Phosphate, Tri-Calcium Phosphate, Soy Lecithin, Tocopherols), Milled Chia Seed, Lecithin, Sucralose. Breakfast is the most important meal of the day but making the same protein shake every morning is tiresome, and making a yogurt smoothie can be time consuming and loaded with sugar. 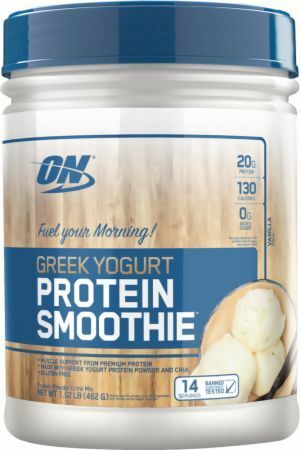 Start your busy mornings with GREEK YOGURT PROTEIN SMOOTHIE – a convenient way to help Fuel Your Morning with a flavorful, high-protein smoothie using just a glass and spoon. 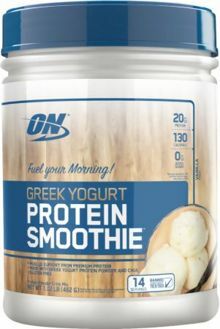 Each serving is made with Greek yogurt proteins and instantized premium whey protein - meaning no blender is needed - for a creamy smoothie to help you start the morning right, help keep you full, and stay on-track with your fitness and nutrition goals.